Original Editor - Laura Ritchie, posting on behalf of Melissa Chea, MPT Class of 2017 at Western University, project for PT9583. See Concussion and Post-concussive syndrome to determine when an athlete is symptom-free and able to return to play in order to reduce the risk of SIS. ↑ Saunders RL, Harbaugh RE. 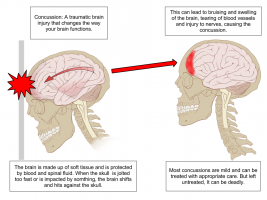 Second impact in catastrophic contact-sports head trauma. JAMA. 1984;252(4):538-539. ↑ 2.00 2.01 2.02 2.03 2.04 2.05 2.06 2.07 2.08 2.09 2.10 Hebert O, Schlueter K, Hornsby M, Van Gorder S, Snodgrass S, Cook C. The diagnostic credibility of second impact syndrome: A systematic literature review. J Sci Med Sport. 2016;19:789-794. doi:10.1016/j.jsams.2015.12.517. ↑ 3.0 3.1 3.2 Stovitz SD, Weseman JD, Hooks MC, Schmidt RJ, Koffel JB, Patricios JS. What definition is used to describe second impact syndrome in sports? A systematic and critical review. Curr Sports Med Rep. 2017;16(1):50-55. ↑ 4.0 4.1 4.2 4.3 4.4 4.5 4.6 4.7 4.8 Cantu RC. Dysautoregulation/second-impact syndrome with recurrent athletic head injury. World Neurosurg. 2016;95:601-602. doi:10.1016/j.wneu.2016.04.056. ↑ 5.0 5.1 5.2 5.3 5.4 McCrory P, Davis G, Makdissi M. Second impact syndrome or cerebral swelling after sporting head injury. Curr Sports Med Rep. 2012;11(1):21-23. ↑ 6.0 6.1 6.2 6.3 6.4 6.5 6.6 Quintana LM. Second impact syndrome in sports. World Neurosurg. 2016;91:647-649. doi:10.1016/j.wneu.2016.04.035.